When I first started thinking about Caprilli I read books by Piero Santini, Vladirmir Littauer and Paul Rodzianko. There was little on the internet about Caprilli. . . Well, there wasn’t that much on the internet about anything. Things have changed. In 2015 there are many sites which “speak” authoritatively about Caprilli – most of them are just spewing out a regurgitated version from another site forgetting where their thought originated. It’s a bain of the internet. 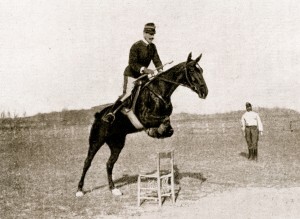 A few call Caprilli “our savior” and most of them indicate that he single handedly had the unique thought that created the modern forward seat – or hunter seat – or hunt seat- or jumping seat or. . .? There really isn’t a lot of information about Federico Caprilli. He was just another cavalry officer who taught riding during a time horses were of paramount importance to a military trained in classical riding for generations; a type of riding that took much skill and created a rider-dependent horse with artificial balance. Caprilli looked for a better, more natural way for soldiers to ride; a way that could expedite rider education and be useful in modern warfare. In the broad view, people were riding forward, trying to get the best performance out of their horse or in the case of Mongols and Natives, riding in the way that felt the most natural, both during Caprilli’s time and earlier, so what’s the big deal? Part of the importance of Caprilli’s contribution to our modern riding is that he changed the way we sit when we jump fences but was that his goal? Actually his goal was to make horses and riders efficient for war. He believed that classical equitation made a horse useless over varied terrain and was too difficult for the average person to learn quickly; that the horse should be allowed to maintain his own natural balance with as little interference from his rider as possible. Caprilli did more than just ride and jump forward. He developed a system. Horace Hayes died 3 years earlier than Caprilli but at a much older age. Hayes leaves us a profile of the training of and attitude toward horses in the public venue in his day. Caprilli bucked the established system for training military horses in the classical dressage of the time. I wonder if he considered anything beyond his immediate circle of influence? Certainly he had no idea that his views and system would effect the entire world for generations, improving the life and performance of countless horses. Call it being at the right point in history or call it unintended consequences, Caprilli’s short life and investigative mind gave horsemanship a new direction. I have forgotten his name/website, but he lives in Virginia/north Carolina…that area…he partially translated Frederico caprilli’/article but last year? or just before..translated the entire article. Frederico Caprilli’ was an amazing man. He did more than change riding. Like you said, an astm helmet. What do I think? I think it is an excellent article exhibiting your usual balanced and unbiased approach in all your writings and comments.I congratulatre you. You’re thinking of Dan Gilmore http://gilmorehorsemanship.com . My next post will talk about the value of Dan’s translation of Per L’ Equitatzione Di Campagna and also about Piero Santini. In my view Dan is the modern day authority on Caprilli but investigate his site, particularly his blog. Dan has a lot to offer. Thanks for your comment and thanks for reading U.S. Horsemanship! Thank you for your very kind comment. It’s always encouraging. U.S. Horsemanship had to “balk” for a bit while life took over but I’m happy to be back at it. 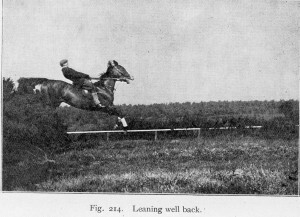 I’m looking forward to a series of posts that try to discuss the basics of forward riding and some of the changes that were brought in through the next horsemen to impact this type of riding. I hope we can get lively conversation started!I’m looking forward to your input. Barbara, thank you so much for this new article on Caprilli. I have been riding Forward Seat for 44 3/4 years now. Throughout the decades Caprilli has been my inspiration for humane riding. When I learned I had Multiple Sclerosis over 20 years ago I sat down and thought about riding as a crippled woman, and I came to the conclusion that the FS was the MOST SECURE seat even if I can no longer jump, ride cross country, or even do the gallop. I was lucky and found a riding teacher nearby me (I’m near Charlotte, NC) that was willing to listen to me and willing to teach me within the parameters of the FS after I educated her about the particulars. It was not hard, she had been teaching hunt seat for a long time,and the pure FS was just a refinement of what she already knew. The reason she listened to me was that she LIKED how her horses reacted to my riding, she liked how her horses moved under me, and she liked how her reactive Arabs calmed themselves down when I rode them in spite of my uncertain balance, hand tremors, and less than steady lower legs. When I re-started riding after my diagnosis I realized that if I was to have any hope for the horses to listen to me I would have to listen to the horses myself. After several years I finally realized that one big facet of the Caprilli revolution was that HE LISTENED TO WHAT THE HORSES WERE TELLING HIM ABOUT HIS RIDING, and considered their comments and reactions as valid. I consider Caprilli’s Forward Seat as the only riding system that literally comes from the horse’s “mouth.” In honor of Caprilli, whenever a horse starts “cursing” me out for my riding, I listen to the horse and alter my riding until the horse becomes calm because he is more comfortable. Personally I get a kick when these super reactive Arabs calm down under me, forgive me my many, many, many riding faults, and end up going around the ring looking like calm cow-ponies rather that fire breathing dragons! I am greatly looking forward for your future blogs on Caprilli and the Forward Seat. I actually have a 1901 edition of “Riding and Hunting” by Matthew Horace Hayes. An excellent book well worth reading and for comparing with other riders/authors of that time period. Jackie – I’m glad to know that you are still riding. You face a real challenge. Thank you for commenting and for reading U.S. Horsemanship. When you read through Hayes it becomes apparent that there was as much controversy and passion involved in topics about horses back then as there is now…has always been. I get the impression that Horace Hayes would have liked to rid the horse world of any vermin that rode forward! I have another of his books Riding on the Flat and Across Country – 1881 – also interesting. When I go through these old books I’m amazed how much of what was still is. It’s good to hear from you. I think Santini needs to come next. I hope taking it easy is for a pleasant reason such as a vacation. I lived 2 blocks from the local country library on Long Island as a kid. Drained them of books on horses. Horace Hayes was among them. 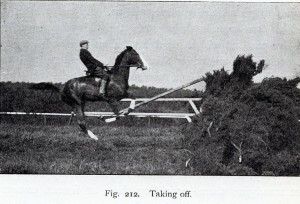 The old books were not so old then and I was quite sure jumping was the most important thing you could do with a horse. That probably planted the first seeds of interest in equestrian history for me. How about you? How did our interest begin?